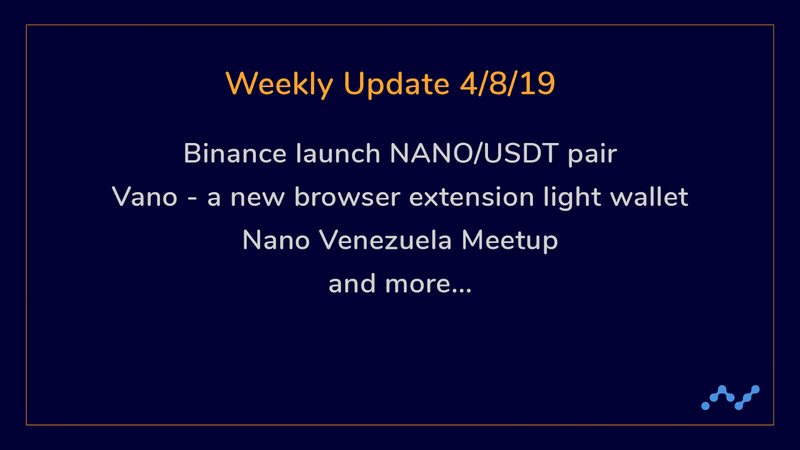 USDT pair now on Binance, new browser extension light wallet in beta, Nano Venezuela meet up and more. As we delve deeper into April, exciting news and developments continue to pop up within the Nano ecosystem. We are happy to bring you the latest happenings in our community in this week’s update! This week Binance added a NANO/USDT pairing onto their popular exchange platform. The community response to the addition was great, and this pairing allows users to trade their Tether for Nano on the Binance exchange. The Nano Foundation will continue to strive towards even more significant exchange listings throughout 2019. On April 3rd, Marek (or Snizzly#5519 on Discord) introduced Vano, a project he has worked on in recent months. It is a cross-browser light wallet extension that supports all essential wallet functions such as creating and importing seeds, sending and receiving Nano, and changing wallet representatives. As of now, Vano is available on the Chrome Web Store (also works for Brave browser users) and the Firefox Add-Ons Store, however, Marek reminds all potential users to exercise caution in storing large amounts of Nano on his new wallet as it is currently in beta. Check out this fun video by @tipanano highlighting the speed of adding Nano to Vano! Thanks for making this video and the shoutout! Vano is an exciting addition to a robust existing wallet pool and a fantastic opportunity to showcase how light both Nano and its wallets can be across platforms! For more information, please check out Vano’s GitHub here. The Nano Center’s NanoSpeed project funded! Thanks to the consistently fantastic Nano community benefactors, NanoSpeed.live has had its server costs for the next 18 months paid for in full. Submitted as a potential project at The Nano Center only weeks ago, the community has responded in earnest and donated above and beyond the requests of creator u/silverstar194. Thanks again to the community for their continued support of so many deserving Nano-related projects. This past weekend saw the realization of another great Nano Center proposal. The inaugural Nano Venezuela meet up and presentation went ahead, following previous delays related to the nationwide blackouts. The complex issues in Venezuela are well documented, particularly within the crypto space, with serious concerns about the viability of their fiat currency surfacing after recent hyperinflation. Many people see cryptocurrencies as potential tools to address this problem, and specifically within the Nano community, members are taking firm steps to raise awareness. 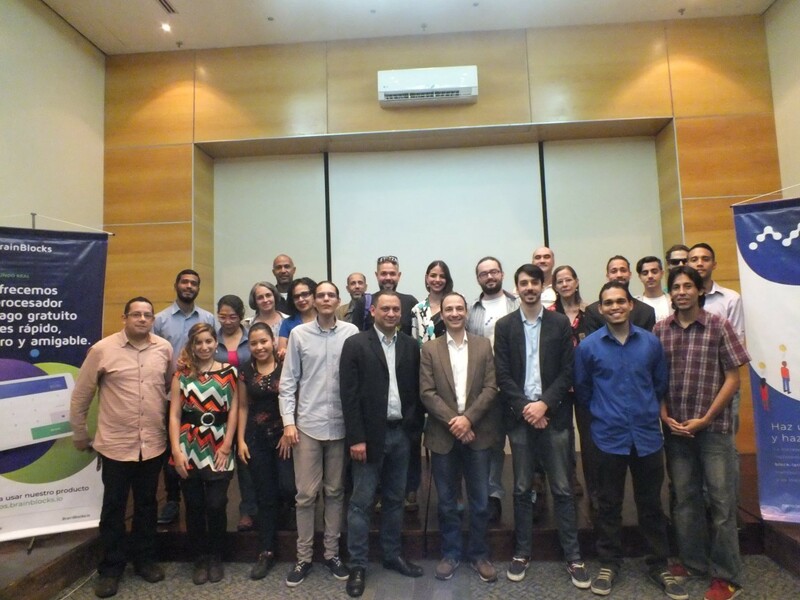 Funded by the Nano community and hosted by Nano Venezuela, with guest speakers from academia and business, the event helped explain the virtues of cryptocurrency to those in attendance. With many more constructive and educational meetings and resources planned, we are keeping a close eye on developments. We would also like to recognize the inspirational efforts and attitudes of the organizers of the event. The progress that has been made, with the support of the community, is astonishing given the upheaval experienced by those involved daily. We thank you all for your passion in embracing and advancing our shared values for what Nano can do for the world. We are still hard at work building out V19 but wanted to bring extra attention to an upcoming change that forces the node to emit nano_ prefixed addresses instead of xrb_ ones. This PR will be merged soon for inclusion in the upcoming V19 release so we recommend all services integrating with Nano verify they support this prefix — depending on how the integration is built it could impact service availability if not handled properly. If you have any questions about this update, please reach out in the comments below. PLEASE NOTE: These changes have no impact on the security or availability of the funds controlled by your private seed. Even if a service you use has not adjusted to the nano_ address change, you will be able to use other services with your seed or use a xrb_ address instead.